The granites remained the same along, with the appliances and cabinetry as well. Simple but impactful and usually it doesn't cost alot to tackle something like this either. I personally like "shiny" ie: glass on a backsplash, they look particularly gorgeous with under cabinet lighting. What kind of backsplash do you have, boring or WOW? Great backsplash! I like the caramel colors! Thank you for sharing your insight into how you can brighten up a kitchen by adding a back splash. Some may find inspiration to add something of this nature to their own kitchen. What a difference! From boring to beautiful... Great work! P.s. Great pendants hanging in the kitchen!--Where are those from? So pretty. When we redid our kitchen 10 years ago, I agonized over tile for the backsplash. Picked a very nice, yet boring tile. Would love to change it! Beautiful! Since I'm renting I can't do much of anything, but the house at least has lots of bold color. I love backslashes too. Probably because I custom paint / carve them. It's a thing. Best. Title. Ever. And the actual backsplash is pretty awesome, too! 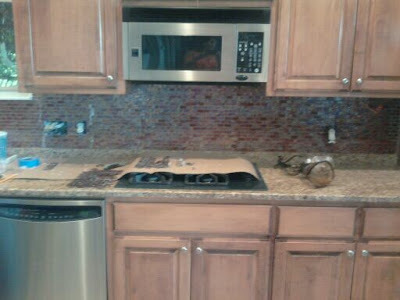 You have done a great job..backsplashes are more than just decorative, they are there to protect the walls from the everyday splashes that are inevitable. Wow, those are some nice changes. I'm really loving the glass tiles lately as well! Thanks for stopping by & leaving a sweet comment on my blog, BTW. It was great to "meet" you. I love an interesting backsplash but alas ours is quite boring. I'm looking forward to changing that some day! Hi, you have a nice and interesting page out there it gives a lot of information to make our kitchen look so good as yours. More power to you! I am Marie Cole, an interior designer who launched an online decorating service for people who are do it yourselfers and need some design help. I want to SHARE, INSPIRE and GUIDE you to the next level of design in your own home. I am married and we have a rock star dog, I am serious, everywhere we go everyone has to stop to see him. Estate Agents in the UK visit Hamptons International first. R & R CUSTOM DRAPERIES, ETC. Moms of Toddlers, Save Your Back!